I frequently want to share Windows network paths to files with other folks on my team via email or chat. We have a lot of mapped drives here, both ones we set up ourselves and ones set up by our IT overlords. What I'd like to be able to do is to copy the full real path (not the drive letter) from Windows Explorer to send to folks. Example: I have a file in my "Q:" drive, \\cartman\users\emueller, and I want to send a link to the file foo.doc therein to coworkers. When I copy the file path (shift+right click, "copy as path") it gets the file name "Q:\foo.doc" in the clipboard. This is unhelpful to others, who would need to see \\cartman\users\emueller\foo.doc to be able to consume the link. In Explorer it clearly knows the full path - in the address bar I see "Computer -> emueller (\\cartman\users) (Q:) ->". Is there a way to say "hey man copy that path as text with the \\cartman\users\emueller not the Q: in it?" I know I could just set up mapped network locations instead of the mapped drives for the ones that I set up personally and avoid this problem, but most of the mapped drives like the "users" share come from our corporate IT policy and can't be overridden. I could just make a separate network location and then ignore my Q: drive but that's inconvenient (and they do it so they can move accounts across servers). Sure my emailed path might eventually break because I'm losing the drive letter indirection but that's OK with me. I had exactly the same problem -- not everyone had the same mapped drives as me, or mapped to the same letters. You can also choose to show only one or two lines on the base context menu, for example you can have two lines, Copy Long Path, and Copy Long UNC Path. It's great for emailing users in your company who have access to a network path, and if they have the same network mapping as you, you can choose the former, otherwise you can use the latter. Update: As of version 12.0, a new "portable" installer is available on the above site, which installs only for the current user into the AppData\Local folder. I've not tried this, but it could be solution for those who are prohibited from installing normally. Can copy \\server\c\prog\net from the file for your use. UPDATE: CoolCool's approach is even easier than mine. Upvote his answer. 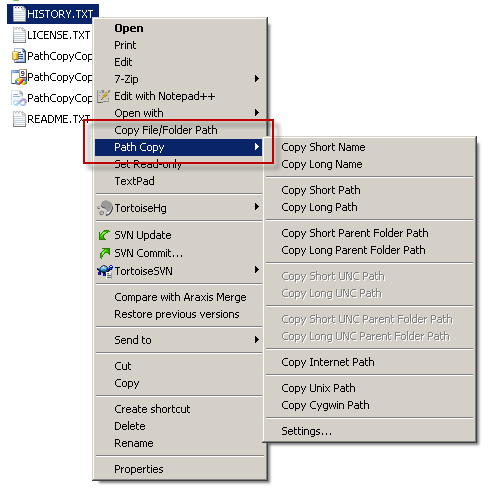 In Windows Explorer, hold the shift button down, r-click on the file, and select "Copy as path". Insert a Hyperlink in the email and paste in the address field of the Hyperlink dialogue box. (Shortcut: ctrl-K ctrl-V + OK). At this point, the link will display the mapped drive letter as the root (Q:\foo.doc). Now, r-click and select "Edit Hyperlink..." you will notice that the Address field has been translated back into the full UNC path (\\cartman\users\emueller\foo.doc). With your mouse in the Address field, hit ctrl-A and ctrl-C to copy the full path to your clipboard, then move your cursor to the top field ("Text to Display:") hit ctrl-A and ctrl-V to display it correctly in your email. then select 'Create Hyperlink Here'. I just had the need for the same thing OP is asking and after searching on Google and reading the answers, none of them provided what I think the OP and I are looking for. The problem here is that one may map a network share to Drive Y whereas someone else in the organization may have the same network share mapped as Drive X; therefore, sending a link such as Y:\mydirectory may not work for anyone else except me. So the solution I came up with (by copying someone else's code) was a little C# program that you can call from a context menu in Explorer and will allow you to translate the Mapped drive letter to the actual UNC path. Right-click Shell --> New Key --> Name: "To UNC Path"
I can provide the executable so you don't have to do the compilation yourself. Simply drop me a note here. Someone named Shawn Keene provided a solution to this in the Windows 7 Forum on the Microsoft website. It is in a feature called Network Place. Right-click on the Computer entry in the left pane and select “Add a network location”. Click next. Select the “Choose a custom network location” option (it was the only one presented to me) and click Next. Type in the UNC path desired and click Next twice. This adds an entry that shows up in left pane of Windows Explorer below the mapped drives, but it works just like a mapped drive and shows up that way in the Save dialog of applications. In Windows Explorer, navigate through that entry to the desired sub-directory and click in the blank area to the right of the bread crumbs path display in the top of the Windows Explorer screen and the UNC path appears and is highlighted. RIGHT drag a file from the folder into Microsoft Word. Hold Shift down and right-click on the file and select "Copy as path". Insert a Hyperlink in the email and paste in the address field of the Hyperlink dialogue box. After you create the hyperlink in the email, you're done. The link will show the mapped drive letter this is true. When the recipient(s) clicks on the link in the email, it will follow the UNC path whether the user is mapped or not. I have tried this in other Office 2010 applications, Excel, Power Point, and Word. You can also right click the directory name in the computer directory view and select rename. This will give you access to copy the path. 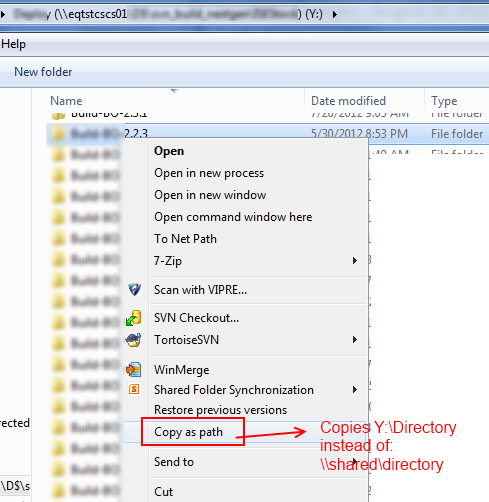 In the explorer window, right click the mapped drive in the file tree on the left. While the Text is highlighted, right_click->copy. Now the path is copied (with some extra text that is easily deleted after copied to a new location. In corporate networks most IT Departments create shares using DFS Name Spaces, within DFS Shares you can right click on a folder and find its target. The other method would be to see if the Share is published into Active Directory. The easiest way for other users to find shares without knowing the UNC path or File Server name / path. If your sharing documents with large number of users, something like Microsoft SharePoint may be a better solution as offers a web interface (with WebDAV for UNC style access) and offers built in tools to alert other users to documents. Place the file on your desktop if you like. Double click it and it will show all your mapped drives. Right-click the folder > Share > " share to yourself (means nothing) . you will get the path. / or \ . or click show all network shared. If you unmap the drive as a drive letter, then re-add it instead as a "network location" (i.e. right click "Computer" on the Explorer Window and select "Add a network location") Type in the full path for the folder. Going forward it will display the full path in the address bar. However, applications that depend upon the drive as a letter may fail. Not the answer you're looking for? Browse other questions tagged windows-7 windows-explorer copy-paste unc mapped-drive or ask your own question. How do I reconnect an already mapped network drive from command prompt? Is there a way to map a network drive in windows to point to two locations under one drive name? How do I prevent Windows 10 from disconnecting mapped drives? How to show currently mapped drives in PowerShell?